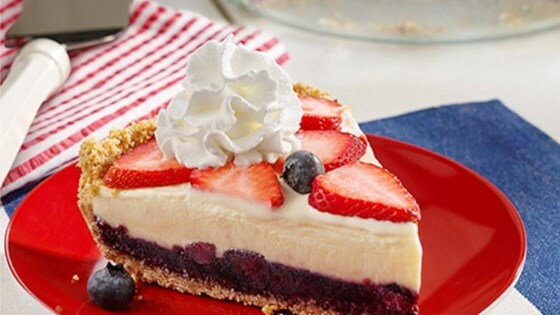 "A vanilla ice cream pie with a homemade graham cracker crust is layered with fresh blueberries and strawberries for a delicious red, white and blue holiday dessert." Preheat oven to 375 degrees F. Spray 9-inch glass pie plate with cooking spray; set aside. Stir together graham cracker crumbs and 1/4 cup sugar in medium bowl. Add melted butter; mix well. Press mixture firmly in bottom and up sides of pie plate. Bake 6 minutes or until golden brown and set. Cool completely, about 35 minutes. Meanwhile, stir together water, remaining 1/4 cup sugar and cornstarch in small saucepan. Add blueberries and lemon juice. Bring to a boil over medium heat, stirring frequently. Cook 5 minutes or until thickened, stirring occasionally. Remove from heat; let cool 5 minutes. Spread blueberry mixture evenly over crust. Refrigerate 10 minutes. Spread softened ice cream over blueberry mixture. Freeze pie until firm, about 4 hours. Arrange strawberries over ice cream. Cut into 8 slices; top with Reddi-wip. Serve immediately. Chef John's tri-color ice pops have strawberry, blueberry and cheesecake flavors. This is yummy but don’t let it set out before cutting it. It melted very fast. It said to freeze 4 hours. I did for 6. Overnight might be better. I will try that next time.